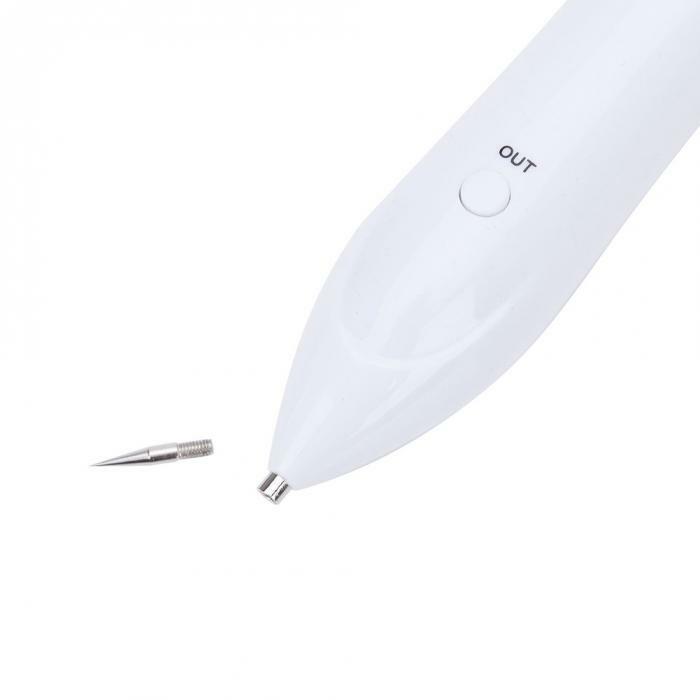 This device is the newest generation of nano-needle product. With Patented Technology, it has been dermatologically tested to be safe to use. 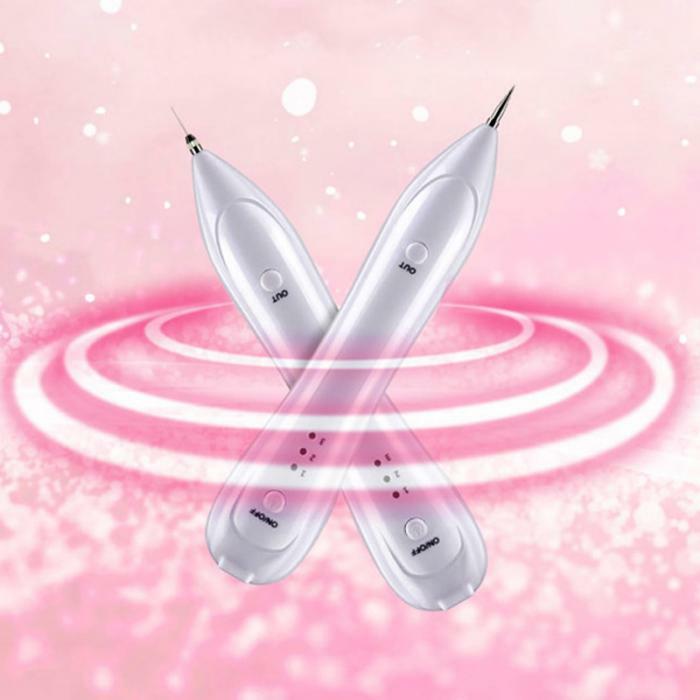 Needles directly work on the freckle spot skin and it will produce a plasma with high temperature immediately. 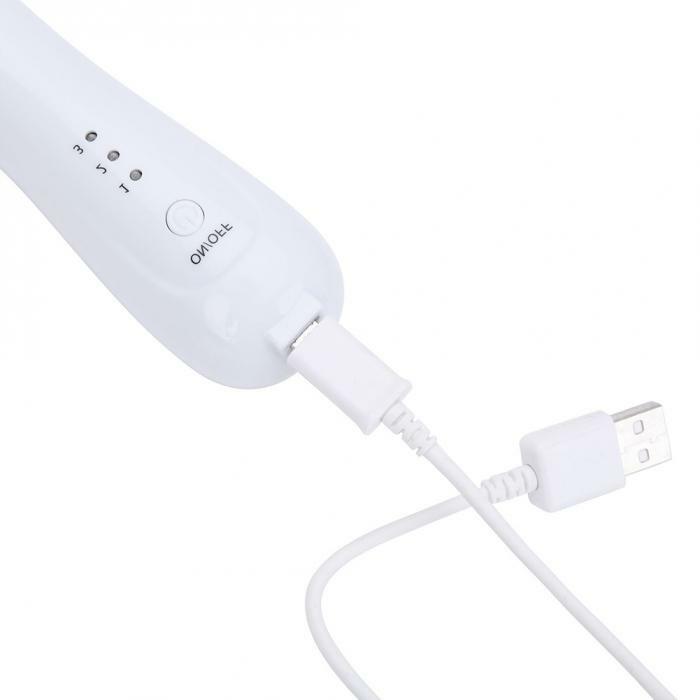 The device is designed to be light and easy to use at the comfort of your home. The microvascular will be solidified quickly without bleeding. Then it will form carbon scabs, protecting the skin from infection. After a short while, the scab will shed leaving the treated area spotless and smooth. 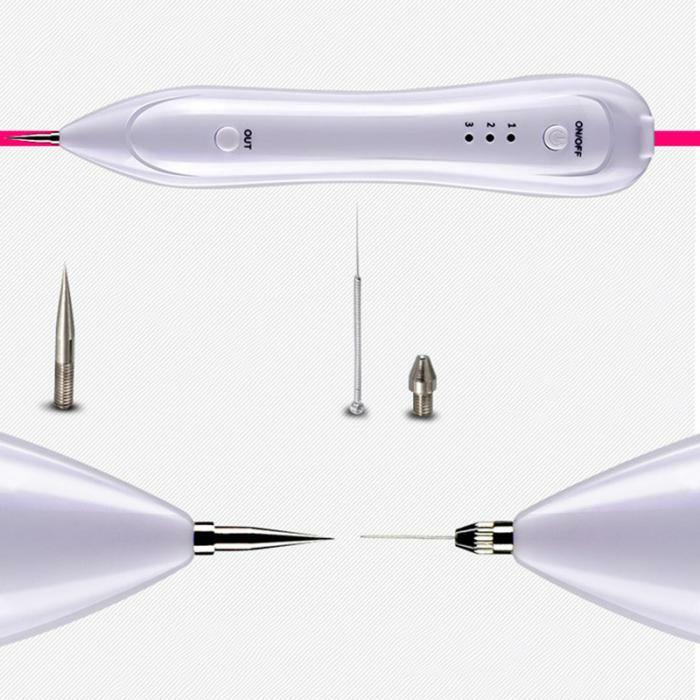 The use of the latest nano-needle technology, microcomputer controlled. It is safe, convenient and simple to use. Easy carry and easy operation. It has 3 levels of intensity for treating different symptoms. 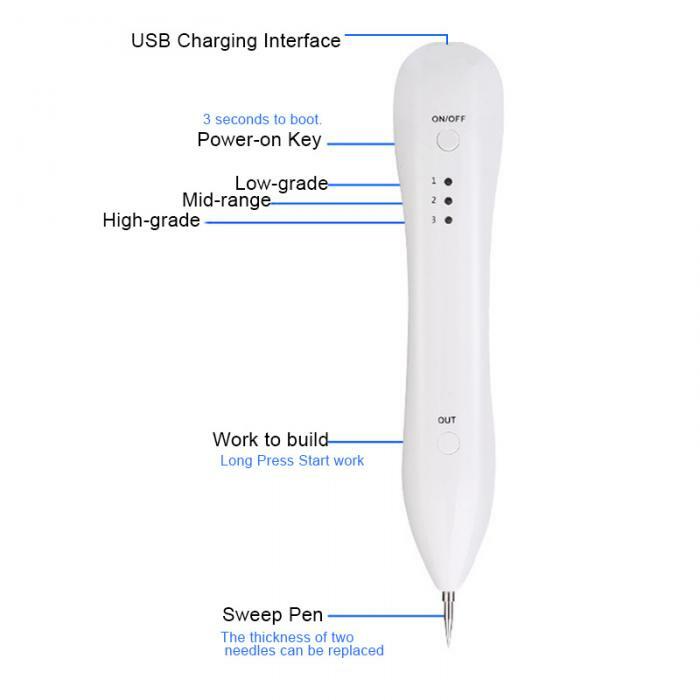 Unique electric ion technology, the use of the process will not make people feel the existence of electric current, no bleeding. Plug-in, cabinet and convenient to carry, charge a time to work more than five hours. It is suggested to test with banana / apple peels when using this equipment for the first time, then to do the treatment after you are fully familiar with this device's performance and operation. Because this equipment can produce high temperature effect in an instant,when not in use, please keep it well, avoid children and people who do not know how to operate this device using and playing with it, to avoid danger happening. Please do not over clean the treatment area within 30 days after using this device(simple cleaning is OK), please do not scrub, please do not make the hard skin fall off artificially. When the scab area is itchy(new skin growing period), please do not scratch it. The scab will fall off automatically after 20 to 30 days. Recovery period is about 3 months, it is suggested that do not eat ginger(affect the smoothness of the skin), beef(can produce light red skin) and soy(can product light black skin) during the recovery period. When not in use for a long time, it is better to charge it every 3 to 4 months to keep the battery using life. When the equipment has problem, please do not take it apart and try to repair it yourself to avoid danger. It is forbidden to clean this equipment with water or other liquid directly to avoid damage and danger. There is no guarantee of specific results and each person results may vary. Please refer to the instructions when you get the product and use with caution. 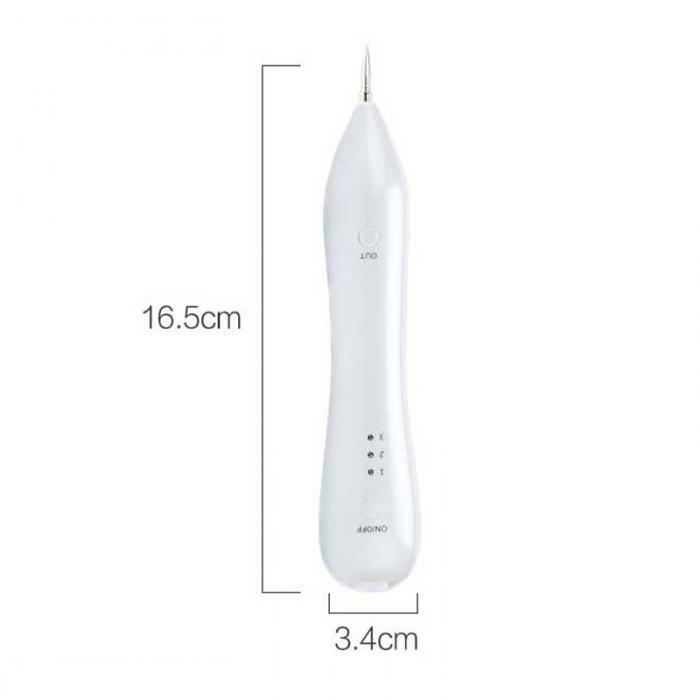 Before using must make sure it is a mole or skin problem that can be safely removed with the device. Consult your physician. We are not doctors we sell this device only. Do your own research and consult a professional if you would like to use it on your moles.